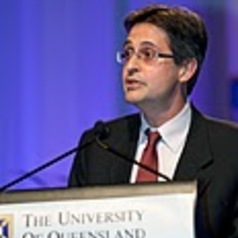 Flavio joined the University of Queensland in June 2006 after more than a decade at the Australian National University, where he was, amongst other responsibilities, the Foundation Director of the Australian Centre of Regulatory Economics. Flavio was also a part-time Vice President with the Regulatory Economics and Public Policy Practice at CRA International in Canberra until May 2006 and a Senior Consultant until May 2007. Flavio Menezes has published over 50 journal articles on the economics of auctions, competition and regulatory economics, industrial organisation, and market design. He is regarded as Australia’s leading auction theory expert and author of a well-known textbook on auction theory published by Oxford University Press. Flavio Menezes has presented seminars and delivered lectures in the Americas, Europe and in the Asia Pacific Region. He has lectured to both academic audiences and practitioners. His academic career has taken him to world renowned institutions as a visitor. He is currently the President of the Economic Society of Australia (Queensland), co-editor of the Economic Record, and a member of several editorial boards and associate editor of a number of international journals. Professor Menezes has a rich consulting experience. Overseas consulting includes being the main advisor on the determination of a privatisation model for utilities, providing advice on electricity regulatory reform, and reviewing government procurement practices. Consulting experiences in Australia include advising the ACCC, IPART, the Victorian Government and the DCC on the application of auction theory to regulatory environments and providing economic advice to various private and public organisations on mergers, competition policy cases and regulatory issues in defence, energy, banking, health, transport and telecommunications.